Tiffany's Online Finds and Deals: A must have for DIY and builders. A must have for DIY and builders. 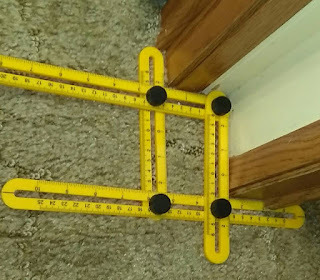 I received the WEBSUN Angle-izer Template Tool Multi-functional Angle Ruler at a discount to review. All opinions are my own. I love how easy this angle template tool is to use. It makes measuring angles easy and cuts out a lot of extra work for me. This angle-izer tool is easy to adjust and durable. The Websun angle-izer tool has made my DIY projects easier and less stressful. Before using cool angle-izers for DIY projects, I would measure with regular projector and ruler which can be time consuming and stressful especially if you like to measure at least twice before cutting to be super sure of measures. The WEBSUN Anglizer is easy to store as it just folds up. I fits great in tool bags. It comes with a storage pouch too. This Angleizer template is just great to have all around. It can be used for getting awkward tile angle measurements, craft projects, artwork, woodworking, construction, and so much more. MULTI ANGLE TEMPLATE TOOLS: The angle ruler can lock any desired angle as a reusable stencil for endless applications. Perfect for DIY-ers. ONE HAND OPERATION: Just place the angle measuring ruler onto your work area, sliding into the shape needed and tightening the screws, then flawless measurement shaped and it can be transferred and tr aced onto any material. Handy and lightweight! APPLICATION FOR ANY MATERIAL AND ANGLEIZER: Create layouts in tile, brick, stone, lumber, laminate and more! The Angleizer Template Tool is handy for creating bull eyes, arches, plumb cuts and any project you want. DURABLE AND ERGONOMIC: Fiberglass filled nylon makes the Angle-izer durable for any job and industry. ABS PLASTIC Material. Durable and Portable.